2nd attempt at review - bought to replace one where mobile connection started to separate after just over a year. (Forgot it had a 2yr guarantee before binning). My Lumia 640 (still hanging on to windows phone !) had been prompting slow charge so thought it was cable. Stared prompting again so maybe not cable. This is probably due to the power supply you are connecting to not providing enough charge. Hope this helps. I bought 3 of these and all have failed. After reading all the positive reviews thought i was unlucky and just had a dud....but none of the 3 charge my Samsung Galaxy Note 4 properly. Never more than 80%. Have tried them with 2 official chargers and the chargers are fine as they work properly with other cables and charge my phone to 100% everytime. I bought an Official Samsung Micro USB Sync & Charge Cable at the same time from here and have no complaints about that cable. It has been reliable and I wish I had bought 3 of those instead. The Olixar connectors are so bulky that I have to take my phone out of its case to connect it which I have NEVER had to do before with any cable I have bought before or since. Very inconvenient. It should have been clearly cited that the plastic is far bigger than an official cable. Prompt service, great customer relationships management. Got this cable to charge the last generation Samsung desk charger with micro USB port. My Galaxy S8 cable, USB-C type, would not work with the charger. This cable works as it should, so as an extra cable it is an excellent buy! Nice clean little package with a greatly manufactured USB power supply inside, very impressed. I have only used the cable and charger once. It do not seem to be faster than any other I had in the past but it may be because I used it in my car piggyback behind a TomTom charger used to charge my GPS. I will try it on its own and see how it performs. Item was what I ordered and it arrived quickly and safely. My item was a simple cord, so not much to say except that it was what I ordered and arrived safely. Very happy with product. Item as stated and was delivered quickly. Thanks MobileZap. I would like to thank the company for replacing the item that originally did not make it to it's destination. I am also satisfied with the product. Awesome product works perfectly for my phone. And when I emailed for info I got a reply pretty much as soon as. A+ from me. Great product, fast charges my phone which I didn't think it would! Would highly recommend this. Fast postage too! Thanks :)! Sorry to hear you have had problems with this item. Please contact our Customer Services so we can assist. The cable did not work with the wireless charger that I had purchased it for. Sorry to hear you are experiencing problems. Can you please contact us so we can figure out what the problem might be? Very happy with the cable thank you. Cheers marg. I am more than happy with the cable and also that the response with sending it, very quick. Thank you Cheers marg. I am very happy as the cable fitted what I wanted it to. Thank you for making this available. Besides having every charger one may need, the description and detail of each is sooo helpful. Shipping is fast and trackable. Glad I found this site!! Very satisfied with product and support received. Is what it is and to that end it's ideal. Happy with the whole process. Arrived promptly. Works perfectly. Good price. Compatible and works perfectly with my phone. This was exactly what I needed to get my HTC One to stop slow charging! I had been looking all over for one! It works perfectly! I needed a replacement charging lead for my Nexus 7 as my previous replacement had developed a loose connection. This cable is far superior to the previous one I had and appears to charge better and faster, but that may be because the other was deteriorating. Whatever the reason I am very pleased with this item. I am satisfied with this product because it successfully worked the first time I put it to use and has kept working since. Thank you for offering this product. Ideal length and seems very sturdy. Works great with my Moto G (2nd Gen) and Nexus 7. Equipment met my needs, had lost previous connectors. Bought this as a replacement lead for my BlackBerry. Works perfectly. This was purchased for a Christmas present for my son together with Olixar hands free kit.....delivered sooner than expected.....one of the items was omitted to be sent in the order I received.I emailed customer services,which I was a bit sceptical about,not speaking via telephone but had a reply within 24 hours and the missing item was then sent out 1st class.For the customer service and speed of delivery I would give 5 stars alone.The products I received look well made and well packaged but obviously cannot say how good they are at working,apart from referring to previous reviews which helped me to pick these items. 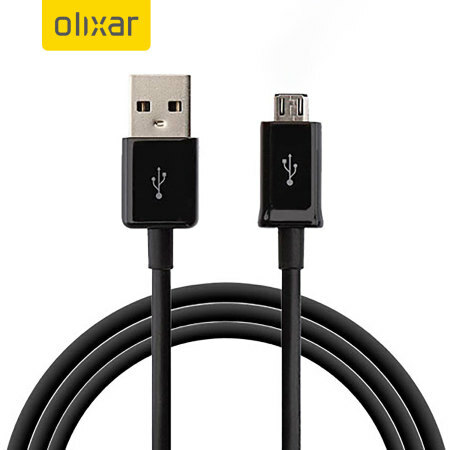 The cable has poor connection with Nexus 5 phones, the cable detaches from the phone socket easily. Takes very long to charge phone and the battery doesn't last. It has bigger USB thingy on one end and smaller on the other. Will connect your USB-powered device to your revolutionary modern USB car charger allowing it to be charged. There's an excellent extra (undocumented!) feature though: the cable can also be disconnected from your device (or the charger or both actually) which allows for discharging. Incredible! I had no issues both charging my smartphone with the cable or discharging it after disconnecting from the charger (using the very same cable). The product is of good quality, I am satisfied with the shipping time as well, came rather quickly. First time I order anything from here and will definitely do so more in the future. Thank you. Purchase and delivery went like a dream. Bought this lead and the Olixar 2Amp USB Car Charger to go with my Olixar Dock & Go Car Holder. The lead gives me plenty of cable to charge my phone while it's in the cradle and the 2Amp USB Charger provides plenty of juice to charge my phone. All items mentioned do exactly as they claim on the packaging. Excellent products at great prices. top-quality cord, allows my phone to charge super fast. Very sturdily built, especially on the min/micro end. Hi bought a charger for my S4 it came with and usb lead which broke as i connected it to my phone for the first time .The main part that you plug in the wall is fine but the lead is very flimsy especially at the connector side .I just threw it in the bin anf kept the plug. Can't fault the high speed charging on Samsung Galaxy Note 4 when plugged into the genuine Samsung charger. Also allows the phone to charge ridiculously fast on a car charger. Ideally, I'd like a little more length, at just on 1 metre it falls into the slightly too short category for me. The only disappointment I've had is that the plastic protector around the Micro USB plug came off, and has had to be glued on. In the first week. Too hard to try and return for warranty though, from Australia. Other than that, great value. Definitely works with fast charge though. Reviewed at 3 stars for a bit short, and the plug protector coming off. This cable is indeed compatible with fast charging as available on the latest Samsung galaxy phones (I have the Note 4). When plugged into the Samsung genuine high speed charger, this cab;e allows the full speed charge, and the "Fast charger connected" notification to appear on the phone's screen. The only negative I have is that I'd like a slightly longer cable. At 1 metre, this can be a little restrictive. That alone is the reason for only 4 tar review. Finally decided to buy a property micro USB lead for my phone after being let down by too many cheap and unreliable copies. I also decided to buy a few to have one in the car. One at work etc, etc. Great purchase,Great quality and am very pleased with them. Highly recommended seller. I recently bought a usb cable for my phone to charge through the computer. I found the site very good with very efficient delivery. Will buy from again. I bought this item,to transfer pictures from my mobile onto my computor,lt works a treat,l am so pleased with it. Delivered the next day,very good product. Sorry to hear that your accessory has stopped working. Please contact us for a replacement. This cable is flexible, good quality rubber and the mini-usb conector is a bit longer than usual, so it will work perfectly with all cases. This product is good, just what I ordered. iv'e got a samsung galaxy s4 mini and the charger cable goes all the way in when being charged but with this charger lead it only goes in halfway it still charges it i'm going to keep it just the same because i can't be bothered to send it back. Looking for a replacement cable for my mobile as my old one was far too ridged and not very flexible. This one is neat, slimline, well made and flexible. Replacement USB wire for wall charger. Luckily this cable has done just the job. I really can't comment if it's as fast as the original S4 cable but it's certainly charging quickly enough for me. If you're looking for a replacement USB cable for your wall charger, I would recommend this. It's comaptible - what a relief! I ordered a micro USB charging kit for our Google Nexus, having lost the original, and am glad to say it works! It takes approx. same time to charge as our I-pad, ie about 4 hours. These cables were cheap and I can recharge/transfer data to my computer from my Samsung Galaxy S4 with no issues. Handy spare for in house living room & bedroom and car. It's not the cheapest cable out there but I've had issues with cheaper ones. if i spent any more on a cable i'd be expecting great things, like faster charging, a better standard of living or more friends. No, it's just expensive enough to make me feel like i'm getting a reliable connection and cheap enough not to feed any delusions of grandeur. I've given it 4 stars not to feed it's ego. keep it real cable. Does what is required and ample length. The Micro USB was purchased to enable photos from my phone to be put onto my PC. The order was delivered next day and worked first time without needing a degree in Computer Science - just what I needed. Not being IT literate, I searched for the product read the reviews and purchased the product which I though would help me transfer my phone pics to my pc. was loaded up and my pictures transferred no problem. Just the right item for an amateur, no hassle at all. Over a metre of cable, perfect for what it's intended. I can now update my phone through the net & backup data, & even recharge the battery via USB. Quick delivery time too. Well done MobileFun. This cable was offered having searched for one for a Samsung B3410....it resided on a page of accessories dedicated to the said model....needless to say I was most disapointed with the hassle of returning and embarking on another purchase....elsewhere! Excellent item well packaged too easy to unpack with the need of scissors, very pleased with item and description and compatibility for my mobile phone. Just what I needed & a very fast service. Does exactly what it's supposed to, great price, great service.